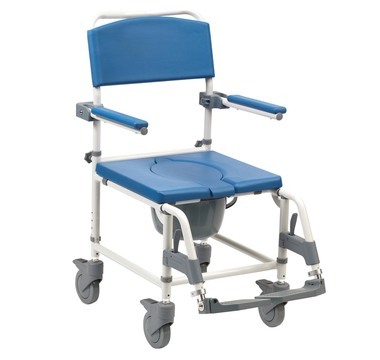 The Freeway T40 Shower Chair comes complete with an extensive 1 year warranty. The Freeway T40 COM is a version of the standard T40 which has been modified to work seamlessly with the Clos-o-Mat Samoa toilet. The Freeway T40 AUTO is for use with automatic toilets including the Geberit 8000 range and Clos-o-Mat Palma Vita. Features pram handle backrest and seat with skirt as standard. The Levina 320 convinces as a top model in the shower toilet seats. Upholstered armrests, a comfortable seat and the ergonomically shaped backrest are some of its advantages. 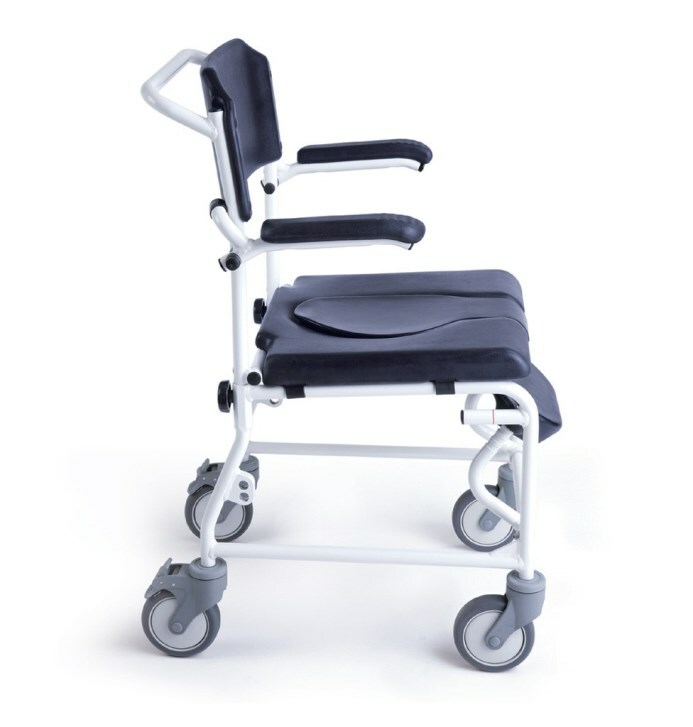 The Freeway T60 Shower Chair can be used both self-propelled or assistant propelled as the 510mm (20”) rear wheel aids manoeuvring over a lip or small step. 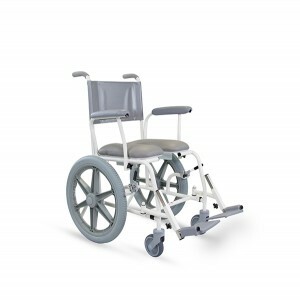 High performance, puncture proof rear braked wheels enable excellent manoeuvrability when self propelling. 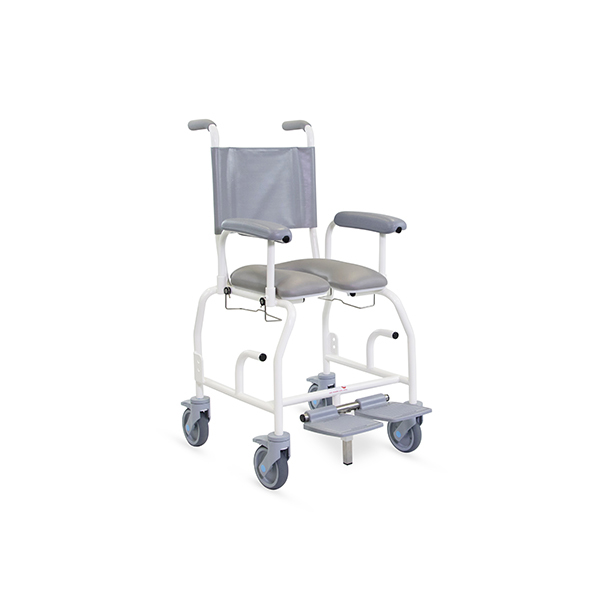 Large diameter plastic and stainless steel castors are included for maximum water resistance and to ensure the shower chair travels smoothly over uneven surfaces and the ramped edges of shower cubicles. Anti-tip bars are fitted to the rear as standard. 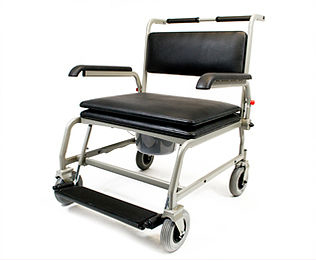 The seat, backrest and armrests are covered in hard wearing, flame retardent material which can be easily wiped clean to ensure a hygeinic care environment. 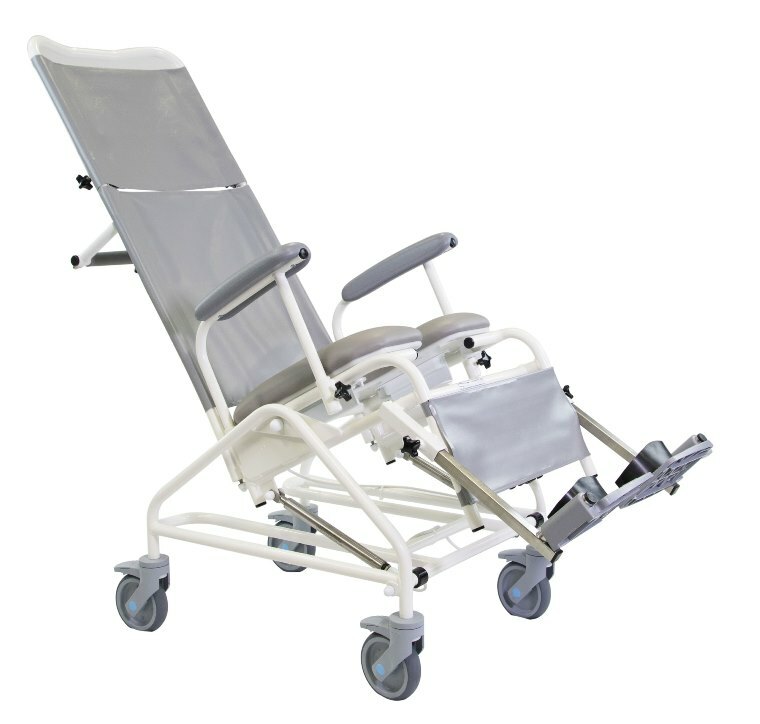 The protective coating of the shower chair includes FREECOTE® – our unique antimicrobial and antibacterial coating which is resistant against the hospital super bug MRSA, e-coli, salmonella and listeria. 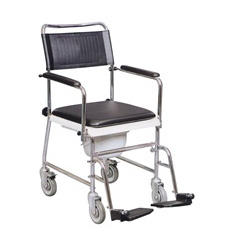 The Freeway T60 Shower Chair comes complete with an extensive 1 year warranty. The Levina 400 is similar in features to the Levina 320. suitability but to be supplied person is more mobile by the drive wheels (24 “) with hand rims. The supply in everyday life is much simpler for the person concerned and the helper. The seating of the Baja Duschtoilette chair allows optimal daily care. The swivel armrests, the adjustable legs and the adjustable headrest make it a comfortable helper. 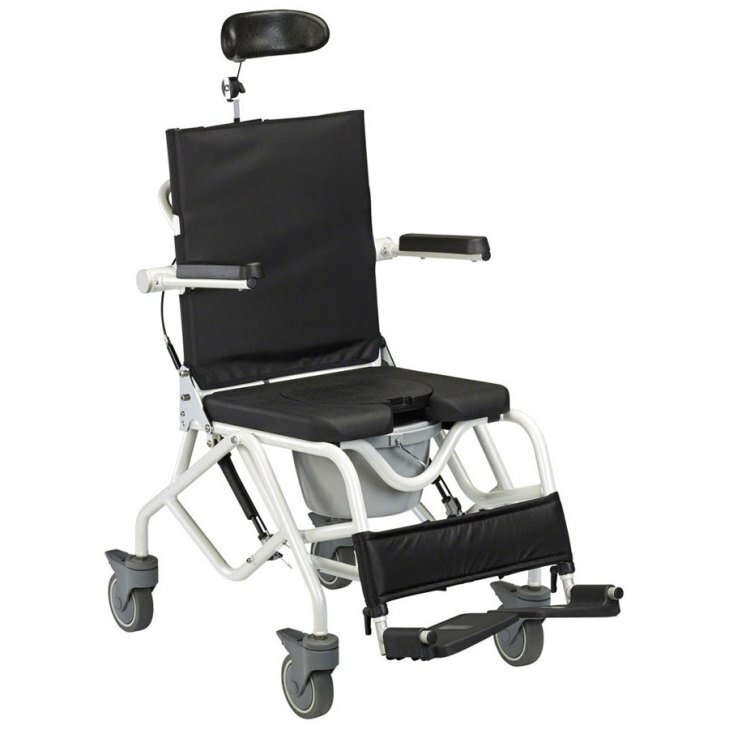 The Freeway T80 Shower Chair is highly versatile and the reclined position has significant advantages for a wide range of conditions, increasing comfort and relieving pressure. Featuring two high quality stainless steel gas struts, the tilt action is easy and light to operate. .Featured images show the Freeway T80 with a detachable headrest. The headrest is an optional extra and is not supplied as standard. A version of the standard T80 which has been modified for use with the Palma Vita Clos-o-Mat automatic toilet fitted on a 50mm plinth. Retro fit kit is available to allow existing T80 chairs to be upgraded to the hydraulic system. 2 = Height with detachable headrest. 4A = Length in upright position. 4B = Length with max. recline including footrests at highest position. 4C = Length max. recline and detachable headrest fitted. 6 = Height to top of seat. 8 = Seat depth (standard seat). 9 = Top of armrest to top of seat. headrest fitted – with headrest add 300mm). 12 = Distance between armrests at rear. 13 = Distance between armrests at front. Footplates are flip up, removable and height adjustable. 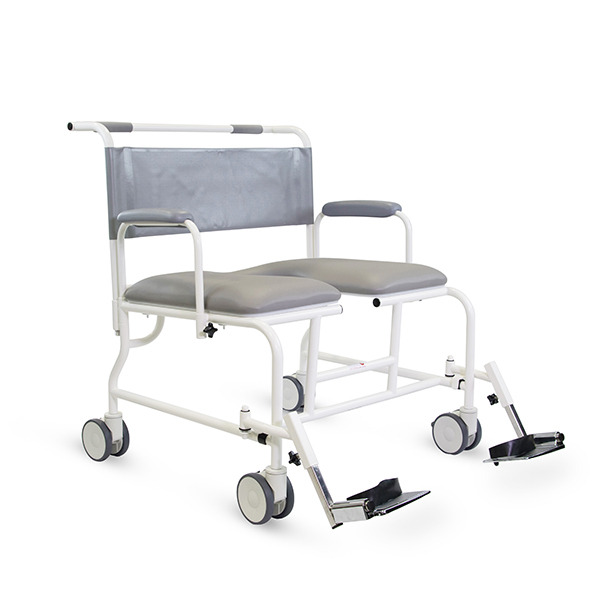 The T90paediatric shower chair is available as an assistant propelled or self propelled model. 3 = Length including footrests (if fitted) at lowest position. 4 = Length including footrests (if fitted) at highest position. 5 = Width of standard seat. 11 = Top of backrest to seat. Seat dimensions are 790mm wide and 550mm deep. 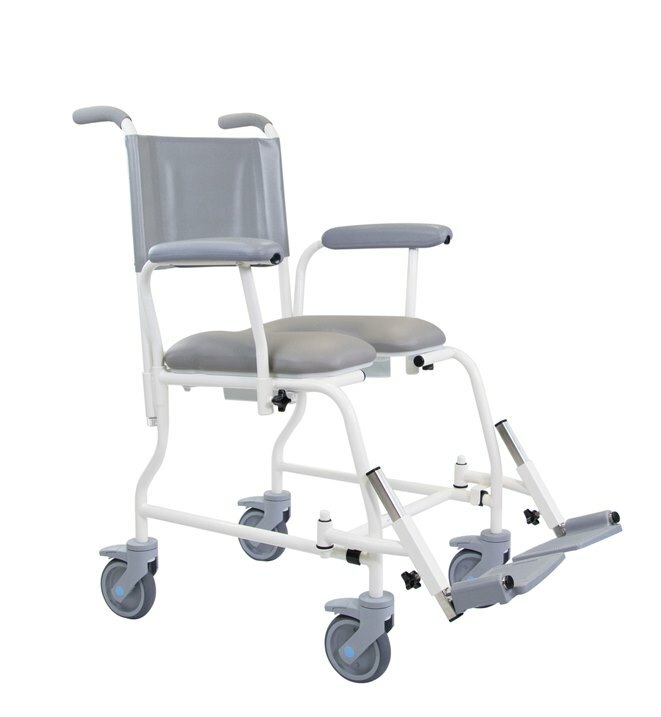 The T100 benefits from increased diameter tubing, special heavy duty castors, heavy duty footrests with height adjustable heel supports which are removable and swing away. We have aimed at designing the best shower commode on the market. 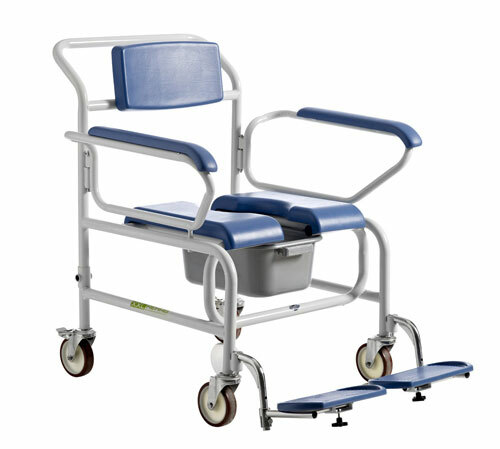 It is designed for easy access, independence, safety and on the care­giver terms. The footrest is always the weak point when it comes to bariatric products. Normally the producer makes a short cut here, by using a standard solution. We did not only design the footrest to carry 100 kg each, we did more! The footrest is also side/width adjustable, so access to intimate hygiene is possible and people with the fat-tissue placed on the inside of their leg can sit with legs apart (up to 110 cm) and still have foot support. The brand new footrest is even nicely covered with PU foam. One of the unique new features is a split toilet seat, a long open hole: 44 cm and 22 cm at the widest point. This to enable a correct use of the chair, it eases access for caregivers and avoids incidents where material ends up in places it wasn’t meant to end up! The ability for bariatric users to reach far back to reach the armrest is usually not present. Therefore we have made the armrests with a length of 64 cm and let it stick out 7 cm from the seat base, ready to welcome and support the hands of mobile users. It enables the user to get into the chair by him/herself. The swing away armrests can be taken off. Another option is the butterfly armrests. Butterfly armrests add more than 10 cm to the seating width. 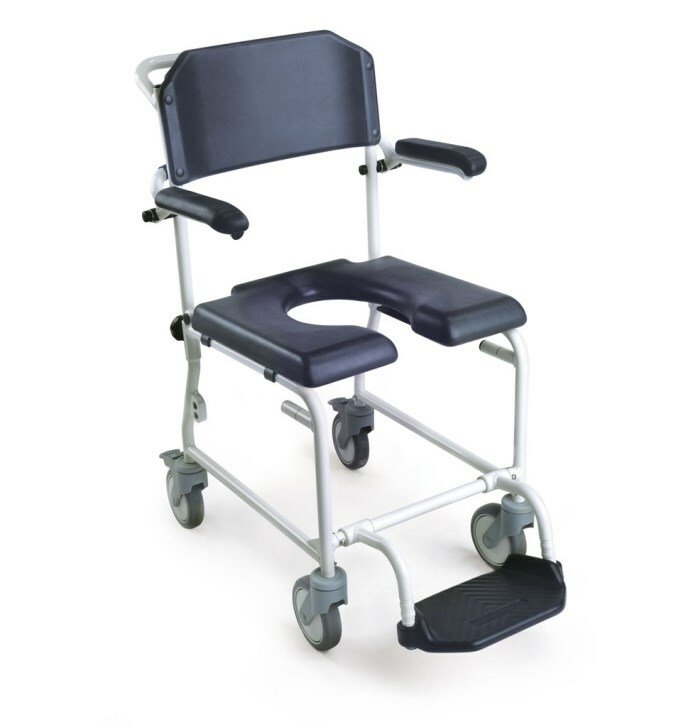 Our commodes are versatile, comfortable and robust which makes it first choice for daily use with heavy weight patients. Armrests swing back so entering and exiting the chair is more comfortable. Footrests can also swing away or can easily be detached. Many options let this chair become the most suitable bariatric aid for patients with obesity. Wheeled and non-wheeled versions available.